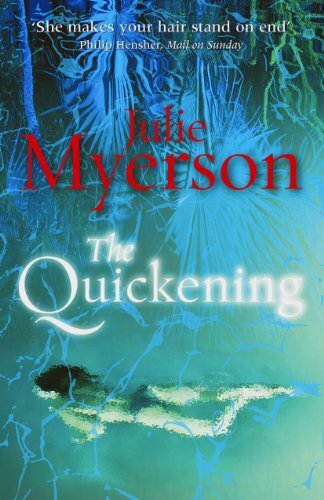 The Quickening is one of a series of shortish horror novels commissioned by Hammer from authors who aren't generally known for writing horror. Other writers who have written for Hammer include Jeanette Winterson, DBC Pierre, Helen Dunmore and Sophie Hannah, and this offering is from Julie Myerson. Pregnant Rachel has just married Dan after a surprise proposal, and Dan has booked, also as a surprise, a honeymoon to Antigua. But as soon as they arrive, Rachel starts to feel uneasy. Objects move and disappear. Food suddenly tastes of blood. A strange man in a grey suit seems to have something he wants to tell her. And a few days into the holiday, a woman is murdered. I did like the choice of setting, as it's unusual for ghost stories to be set in hot, bright, sunny environments, and I'm a firm believer that idyllic tropical locations can be just as oppressive and frightening as dark and gloomy ones. There's also some interesting things to be said about how the line between caring for someone and bullying them can be a very fine one. The plot though is weak and largely predictable and the pace is very uneven with a rushed and slightly incoherent ending that comes after a plodding and repetitive build-up. All the direct speech is rendered without quotation marks, which works perfectly well in some novels but adds nothing to this one and simply irritates. While I don't need characters to be likeable to enjoy a book, I do need them to be interesting, and nobody in this book fulfils that requirement. Rachel is a weak, insipid woman, the sort who picks at food and shows zero enthusiasm for pretty much anything, and despite everything she goes through I found it hard to sympathise with her. Dan is patronising and overbearing and it's hard to see what on earth Rachel could possibly have seen in him in the first place. It's obvious that something has to give, and what that something will probably be. The horror isn't particularly frightening, and the sense of claustrophobia comes more from being stuck with Rachel and her endless passivity than from any creeping unease. I've no idea how long Rachel and Dan''s honeymoon was actually supposed to be, but no fictional holiday has ever felt more implausibly lengthy and eventful or more peppered with stereotypical characters, and I include in that the one enjoyed by Keith Barron and Gwen Taylor in Duty Free. At the point four-fifths of the way through The Quickening when Dan mentions they've 'only' got 10 days left to go, I actually laughed out loud, and not in a good way.